Spotted at the game: a lot of West Coast Bostonians. 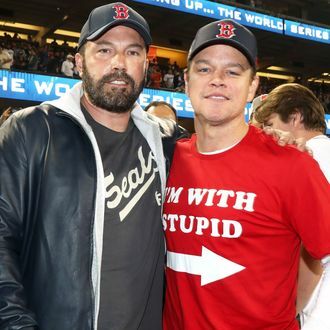 Newly (officially) divorced Ben Affleck and Jennifer Garner were at the game, plus Matt Damon, and Lil Wayne. Summer crush Andy García, Jason Bateman, Judd Apatow, Jimmy Kimmel, and the Born-ed Star herself Lady Gaga were there supporting the Dodgers.